This beautiful hotel is a traditional Japanese ryokan style hotel. It is very quiet and is surrounded by greenery. 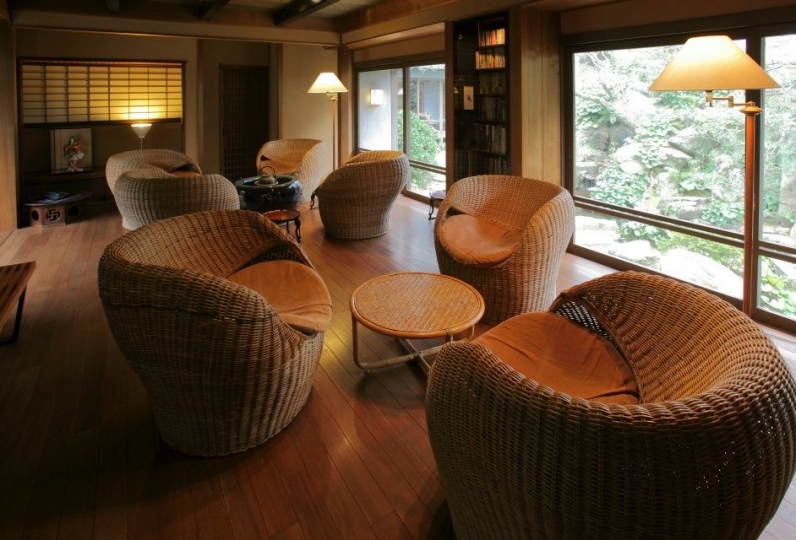 Despite being located in the heart of the spa town of Ureshino, it has a relaxing and tranquil environment. This hotel is a historical building founded in 1925 and you can feel the trust of this hotel in history and tradition. Once you enter the hotel, you can feel the calming atmosphere and forget your busy days. This hotel was designed by Junzo Yoshimura of the Japan Art Academy who designed the new Imperial Palace in Tokyo. The hotel has visible beauty anyone can see and is filled with attractions throughout the hotel. Delicate service shows through our thought. We put forth great effort to ensure guests are satisfied and we want to be a perfect hotel for their stay. The Ureshino hot springs are among the top three destinations in Japan for hot spring water. The water is good for drinking and bathing in. You can enjoy a small waterfall and a beautiful pond with carp fish in the bathing room. Please enjoy our specialty dishes such as seafood from the Ariake Sea as well as Saga beef. There are also other dishes such as hot water tofu, which uses the hot spring’s hot water to boil tofu. Our chef delicately cooks this tofu, which comes directly from our Taishoya tofu factory.The multi-course meals change monthly, and uses fresh seasonal ingredients. While keeping a steady warm hospitable environment, Taishoya hotel holds onto old valuable traditions, and also strives to create new styles and attractions for guests to enjoy. The trip this time was truly satisfactory. My father used the wheelchair. There were several steps of stairs, three of men gently holding them together with the wheelchair I really appreciate it. Thank you for giving us the words of your concern that "the making of the hotel is in this way ..." to us that we were forced to take for granted and thankfully. Even those in charge of the room were really comfortable and they responded quickly anything, and all the family members had a good time. Also, thank you for having a nice cup for my son's birthday celebration. My son who came back to Tokyo had taken home immediately. I think that I will use it carefully in my memory. Everyone at the Taisho store, thank you very much for the fun two days. I am looking forward to eating cuisine of hot springs and T's supervision (which seems to have been withdrawn from the chef) as well as shiba leaves and shrines. Although it is not an apartment that says a fashionable designer ryokan, with an outdoor bath, etc, it keeps the style of a traditional large ryokan old style, it makes me feel warm and nostalgic feeling back to Showa era. I will write down the points I dared to care about this time. · Cooking: Although it seems like a familiar orthodox kaiseki dish at first sight, though I think that it tastes more convincing than anywhere, when eating it is a Taisho shop's cooking and selfishness, but this time about taste It was a little disappointing. At dinner (pine), sashimi and meat were delicious, but I did not feel the usual skill in the dishes with other hands added. Although it is a bit different, I personally felt it was a big difference. Also, the meat's solid fuel was too small to burn all the meat, all the family needed additional fuel. Where half-baked, I immediately baked the rest, but it was almost raw condition. There are fuels not matching the amount of meat. I think that you will understand it when tried. · Although Wi-Fi is recognized, it is hardly connected to the net. It seems to be crowded. I think that it is okay to put the equipment individually at least for the special rooms. I wrote a lot, but it is one of the most frequented inns. I support you. The room was large, I was satisfied also with the hot spring which is attached to the room. However, it is the impression that it is suitable for the price. Regarding the service, I was exhausted, so when I requested that I could have your futon spread immediately after checking in, I responded well. This was saved. -Taishoya uses the famous Ureshino hot spring water, which is among the three best-known hot springs for improving the beautify of your skin. If you drink the water, it will improve the performance of your liver and intestines. 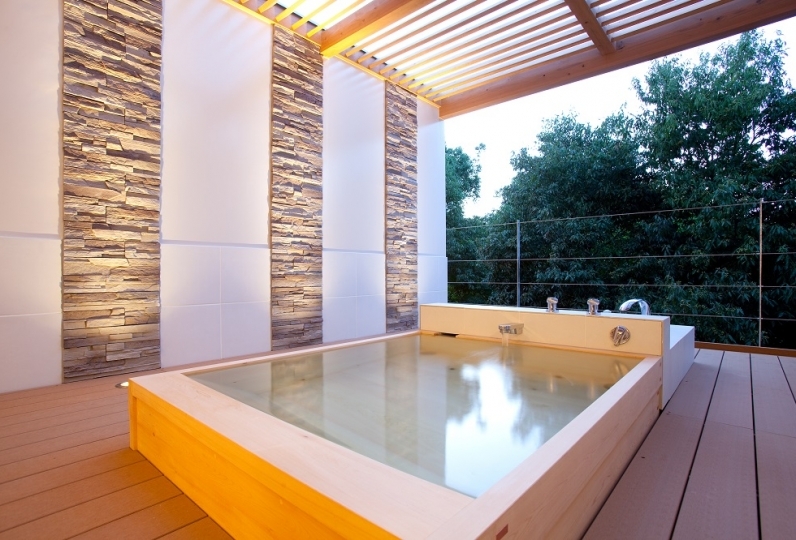 ■Shiki no Yu- A liberating, wide, and bright open air bath. ■Taki no Yu- You can take a bath while enjoying the waterfall garden and the carp swimming in the pond. -In total, there are 4 different types of hot springs guests can use. Taishoya has two types available in the hotel, and Taishoya’s sister hotel has two additional types available. There is a free shuttle bus that can be arranged with the front desk staff to take guests to and from the sister hotel. -There is an esthetics salon in the hotel. Services include facial and full body relaxation massage. As an example, the facial relaxation special course is 60 minutes long and costs 7,000 Japanese yen (plus tax). Please contact the concierge for more information. -The hotel has an on-site restaurant and night lounge, as well as a tea room and souvenir shop. -There is an additional fee of 150 Japanese yen for hot springs. If taking train to the JR Takeo Onsen Station, you must take a 30 minute bus from there to the Ureshino Bus Center. From the bus center, it is a 3 minute walk to the hotel. There is a shared shuttle taxi from Ariake Saga Airport. -These shared shuttle taxies are available during every flight arrival at Ariake Saga Airport. *Reservation is required. Please let the hotel know by 12:00pm of the day before you arrive.